Each tube is precisely tuned to the E pentatonic scale. Thick tubing walls create a melodic and soothing sound that will let you hear nature like never before. Each wind chime comes with an "S" hook that makes it incredibly easy to just hang your new chime anywhere you want. A SPECIAL SYMPATHY GIFT for our loved ones when they need it the most. 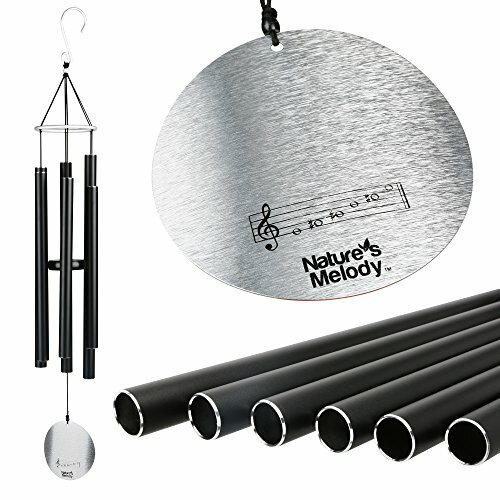 Nature's Melody Wind Chimes make it as beautiful memorial gifts for both men and women. Engravable sail allows customization and makes the chime unique. This Wind Chime is entirely made of metal, all parts are aluminum and the 6 recycled-aluminum tubes are coated with a corrosion-resistant black powder finish. Strong nylon strings make it perfect for outdoor gardens (or indoors). Money Back Guarantee: Not satisfied? Don't worry. We'll gladly issue a refund. 1-Year Product Replacement Insurance: Had any issue with your wind chime? Don't despair, we'll send you a replacement ASAP. With This Risk-Free Purchase, You Have Nothing To Lose; So Scroll Up To The Top, Click "Add to Cart" and Get Your Wind Chime Delivered To Your Door In 2 Days! What Makes Our Melodies Unique? 6 Aluminum Tubes Precisely Tuned By Master Craftsmen To The E Pentatonic Scale. Quality Speaks For Itself: All parts are aluminum and the tubes are coated with a corrosion-resistant black powder finish. Additionally, strong nylon strings to keep your chime up for years to come. Hang It In Less Than 5 Seconds... Literally. "S" Hook Makes It Super Easy To Hang your Chimes Wherever You Want. If you have any questions about this product by Nature's Melody, contact us by completing and submitting the form below. If you are looking for a specif part number, please include it with your message.